Science and justice go hand in hand. 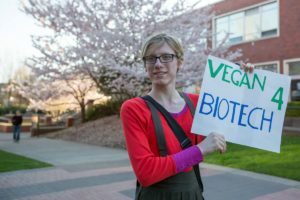 If you see veganism as a movement for justice then you better be at the March for Science this weekend. That’s what veganism is for us. Not a weight-loss diet, not a fad, not a marketing gimmick. Veganism is how we express our belief in reasoned justice. And that’s precisely why we claim science as one of our most important guiding principles. Justice requires a solid bedrock of facts. The scientific method is the best tool we have for establishing objective facts. Full stop. Animals’ capacity for suffering is a matter of scientific fact. Homo sapiens’ ability to thrive on a plant-based diet is a matter of scientific fact. We can’t construct a coherent case for animal justice without the science. Additionally, science provides us with tools to reduce and replace animal products. Consider a few examples: Science led to the development of synthetic insulin to replace animal-based treatments for diabetes in 1978. Today, organ-on-a-chip technology is being developed which could significantly reduce the need for animal subjects in medical and pharmaceutical research. A few years from now we’ll see mass-scale production of synthetic, cruelty-free alternatives to meat and dairy. The possibilities are only bound by our collective imaginations. But efforts to undermine science threaten our potential for scientific discovery. Much of the vegan case for animal justice relies on science. Science presents opportunities for solutions. It should be clear to us by now that science illuminates the path forward. One note of caution though: If we accept the scientific consensus in these cases, we cannot turn around and deny other scientific facts. We can’t fall victim to PR campaigns aimed at manufacturing false scientific controversies. Despite overwhelming evidence to the contrary, myths about vaccines, “toxins,” nutrition, and GMOs are still lurking in vegan spaces. That kind of inconsistency is a stumbling block to our movement, and therefore a detriment to animals. 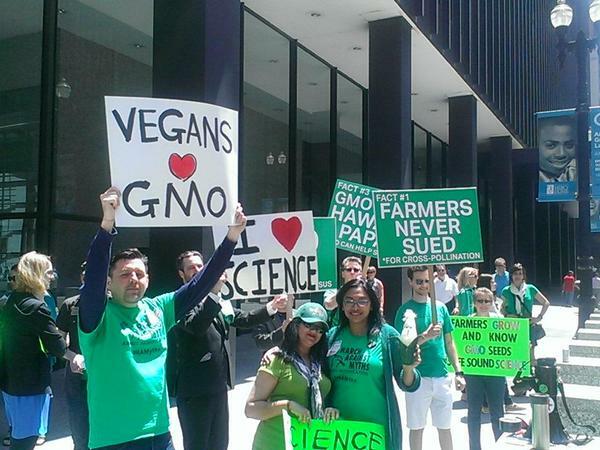 At Vegan GMO we are committed to addressing inconsistencies that hamper our movement for justice. We promote scientific advancement that helps human and non-human animals. That’s why we’ll be marching. So on April 22nd, we hope you’ll go to the March for Science in Washington DC. Or you can join one of the 500+ satellite marches around the world. Show them that our ethical position is a conscientious extension of scientific facts. Show them that the scientific method is the rock our movement is built on. When they ask you why you’re marching, tell them you’re a proponent for justice. Because without truth there is no justice. And without science, “truth” is just another unsupported opinion.